Did you know that Montauk is the self-proclaimed Surfcasting Capital of the World? Maybe that’s why it’s the perfect setting for Dr. Lewis Gross’ novel Montauk Tango! Also known as surffishing and beachcasting, surfcasting is the sport of catching fish standing on the shoreline or wading in the surf. Surfcasting may or may not include casting a lure or bait, and the sport includes all types of shore fishing, whether done from a sandy or rocky beach, a rock jetty, or a fishing pier. Additionally, surfcasting is typically done in saltwater. The art of surfcasting is a specific technique that separates the surfcaster from the ordinary pier or boat fisherman. Surfcasting consists of specialized, two-handed casting techniques that are used to cast the lure or bait to a farther distance in order to reach feeding inshore fish. To achieve this distance, the entire body, rather than just the arms, must be engaged. 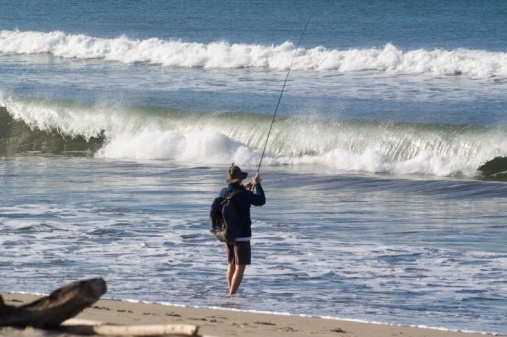 As with any water sport, there are dangers associated with surfcasting, so it’s important that surfcasters pay attention to water conditions, including whitewater or rough water, undertows, low tide, and more. Additionally, the proper attire must be worn, including waders, a wader belt, and wading cleats, and the appropriate equipment precautions must be taken, including handling razor-sharp hooks and lures with care. Why is Montauk Great for Surfcasting? So, what makes Montauk a prime location for surfcasting? Located on a peninsula, Montauk is surrounded by ocean on two sides, making it a center for beach and water-related activities. Montauk’s huge population of Blue Fish and Striped Bass also makes it an exciting place for enthusiastic surfcasters and fisherman of all types to fish. According to surfcasting.com, the best place to surfcast in Montauk is under the Montauk Lighthouse, with the North and False Bars, Shagwong, Camp Hero, and the Land of the Giants following close behind. Surfcasting is just one of the things that sets beautiful Montauk apart from the rest of New York and the rest of the country. Stay tuned for more quirky and interesting information about Montauk, and for more information, pick up a copy of Dr. Lewis Gross’ book, Montauk Tango. This entry was posted in Montauk and tagged Dr. Lewis Gross, Montauk Tango, montauk tango novel, pier fishing, shore fishing, shorefishing, surfcasting. Bookmark the permalink.